Occasionally My Car Quest readers write in with their interesting car stories and photos which I love to share with everyone. Today Alexander Oet of Belgium has sent in photos of his pink Rolls Royce Shooting Brake that at one time was located in Marbella, Spain at the same dealer that was mentioned in a Post about the Ghia 450SS. This dealer came up because of another Post about the Ghia 450SS and another reader, Julian Wolfendale, sent in a photo of a dealer’s facility where he saw a 450SS many years ago. Alexander recognized this photo as the dealer where his special Rolls Royce once resided. Photos of the pink Rolls Shooting Brake are below. Herbert Putz who bought a De Tomaso Mangusta, that I had written about about two years ago, sent in photos of his beautiful Mangusta after a color change. Below are photos of Herbert’s green Mangusta. As we see here the color of a special car can make all the difference. It happens that many years ago I bought a pink Rolls shooting brake with pink leather and chrome roof rack. The Dutch owner I bought it from told me the car was sold new to a prince for his wife and before the car was residing in … Marbella. The car is still in brand new original condition, and since it is pink, only my wife with the family drives it sometimes, with me … sitting next to it. The interior is also pink and this most likely is the car from Marbella sitting next to the Ghia 450SS. Herbert Putz of Austria bought a De Tomaso Mangusta in Southern California that I wrote about here on My Car Quest. This is the Mangusta that was restored by the famous American hot rod builder, Doane Spencer. As you can see from Herbert’s photos he has changed the color from red to a beautiful green. A great choice in my opinion. He also found original Mangusta wheels. Great job Herbert! My thanks to both Alexander and Herbert – let us know what you think in the Comments and I hope you will share your stories and photos. Photos of a pink Rolls Royce and a green De Tomaso Mangusta. thanks for the commendation! The decision which color to choose was not easy. At the end it was the “verde gemma” you can see in the photos. It is a period color and supposedly one of the colors on the Mangusta color-wheel, which was important for me too. All in all it came out to be a full restoration instead of the planned cosmetic and technical improvements of the car (like in most of the cases :-)). A challenge too was to get the original rims. That color on the Mangusta is one of the very best colors you can put on that car. Italian cars from the 60’s and early 70’s look so much better in rich metallic colors. Wonderful restoration of a superb car. The pink Rolls is very interesting both in the color and very thoughtfully constructed shooting brake design. A family car and a sports car – just right for all your driving needs. 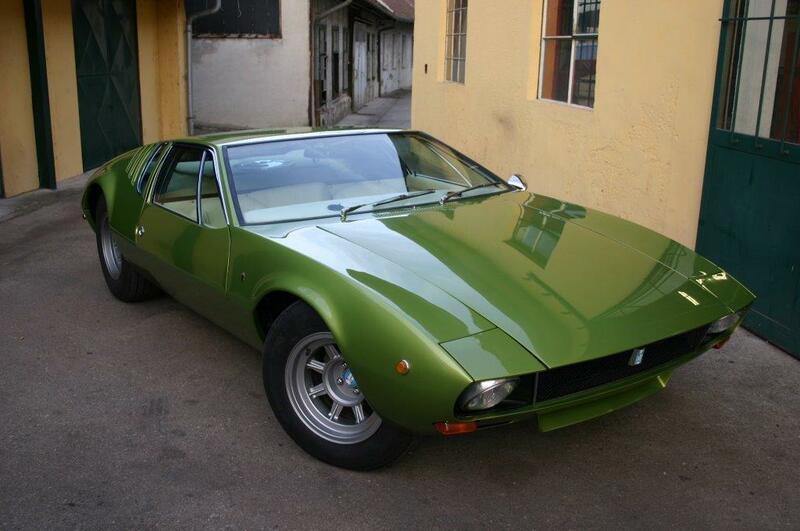 I‘m searching for the Color Code for a Green De Tomaso Mangusta. Can you help me. No sorry – try contacting the DeTomaso or Pantera club. Finding a color code for an old paint color may not help much. Usually the paint shop wants to see a physical sample of the color you want.